Assuming the fact that there are nearly 20000 different orchid species with different growth requirements, and also there are so many different growing techniques, different orchids require different amounts of different fertilizers with different compounds and with different frequency. For instance, pleurothallids orchids such as Masdevallia and Dracula genera are regarded as oligotrophs, which means that they require more diluted fertilizers with low frequency to thrive. But such heavy-feeders such as Cymbidium orchids require more macro- and micronutrients. The most common Phalaenopsis orchids need more balanced mixtures evenly throughout a year because they do not have a dormancy period. Vandas and other monopodial orchids have similar requirements. Sympodial orchids such as Cambrias, Cattleya-intergenerics, Dendrobiums and other do have dormancy, which means that they do not need feeding at these periods. When sympodial orchid starts to grow (in spring in the Nothern hemisphere) you should feed it with more nitrogen, when bulbs starts to form, you have to switch to more balanced solutions, and when buds start to appear switch to more phosphorous-potassium fertilizers. As bulbs mature, flowering is ending and orchid begins to become dormant, you have to stop feeding and reduce watering. Pleurothallids require RO water and more dilute fertilizers, and high ion concentrations could kill their tender roots. If you grow your orchid on organic media such as n\bark, osmunda, cocoa chips or sphagnum you can feed your orchids less frequently, because it obtains nutrients from decomposing organic material, if you grow orchids on inorganic media such as lava, ceramic or epiweb you have to provide them with more nutrients, because such media do not provide nutrients for plants. If you use RO water, your fertilizer should contain calcium and magnesium as well. What’s about organic fertilizers? 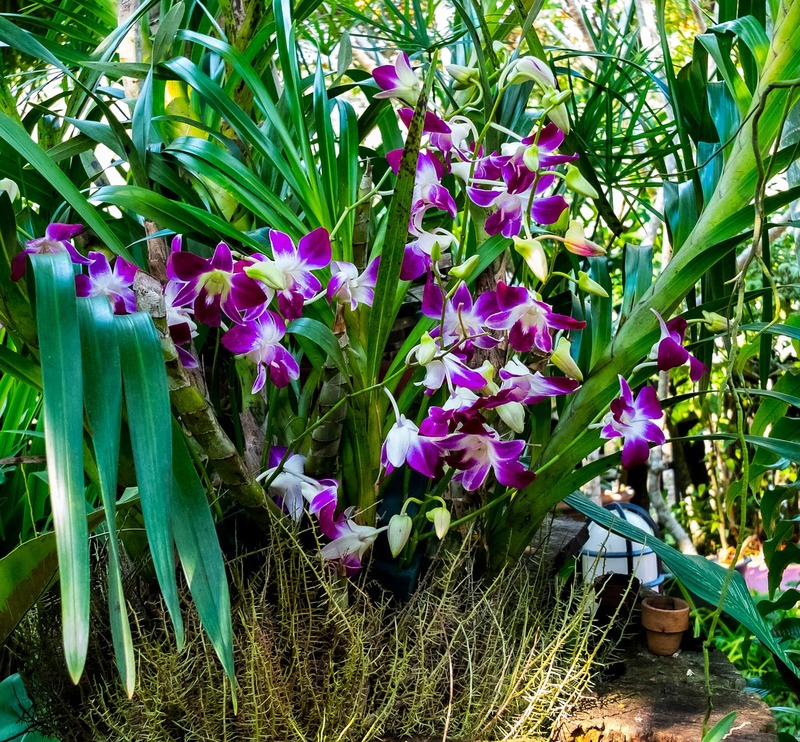 You should know that orchids could use organic fertilizers and thrive on them. You should remember, that despite its advantages for a plant, organic fertilizers can fasten bark, sphagnum and cocoa chips, which means that you should repot your epiphytic orchids more often, as decomposed media do not provide orchid roots with required amount of air and they can die under such anaerobic conditions. Terrestrial orchids such as jewel orchids – Ludisia, Anoectochilus and Macodes – also thrive on organic fertilizers, because in nature they take advantage from decomposing organic matter of a forest floor. There is also a good practice of foliar fertilizering, because in nature an epiphytic plant uses all own “body”, including leaves and stems to collect any detritus and litter to obtain some more nutrients from that. That’s why foliar fertilizers are applicable in orchids – and even preferable for mounted orchids because of their specific growth habit. Another advantage of foliar fertilizers is that you could use more concentrated ones and apply them directly to plant photosynthetic parts, which means that the plant can gain access to these nutrients faster. But there is some disadvantage – such fertilizers are not applicable to jewel orchids, as their leaves, the most precious part do gain smudges and stains, and in cold conditions any drop of water in leaf axils could cause rotting and death of a plant. When and how often to feed orchids? If you grow them potted in media, you should remember that you have to feed them only after watering, when roots are wet and velamen layer became green. Applying fertilizer on dry roots could cause their burn and death. If orchid is actively growing, especially at summer months, you should feed it weekly, at winter months you should not feed orchid at all if it is dormant or feed it monthly if orchid doesn’t have dormant period such as Phalaenopsis. What’s about concentration of mineral fertilizers – for most orchids, maximum concentration is 1 gram per liter (250 mg per liter for Pleurothallids) and 4 gramm per liter for foliar application. There are a lot of difefrent orchid fertilizers on the market, and we hope that this information will help you to choose the best fertilizer for your orchids.